Flipped Classroom. Formative Assessment. Differentiated Instruction. Blended Learning. These terms are just a few among the growing list of popular approaches gaining traction in today’s classrooms, either because they offer innovative twists on valued instructional methods, or uniquely pair new and old strategies that work effectively together. Take Blended Learning, for example—a mash-up of familiar face-to-face instruction with technology-rich digital content or activities that offer students a way to learn that’s multidimensional, differentiated, and engaging. Then there’s App Smashing, another form of blending specifically involving technology tools—a mash-up of various tablet-based applications to “create projects or complete tasks” that play upon the apps’ strengths to augment the learning experience for students. 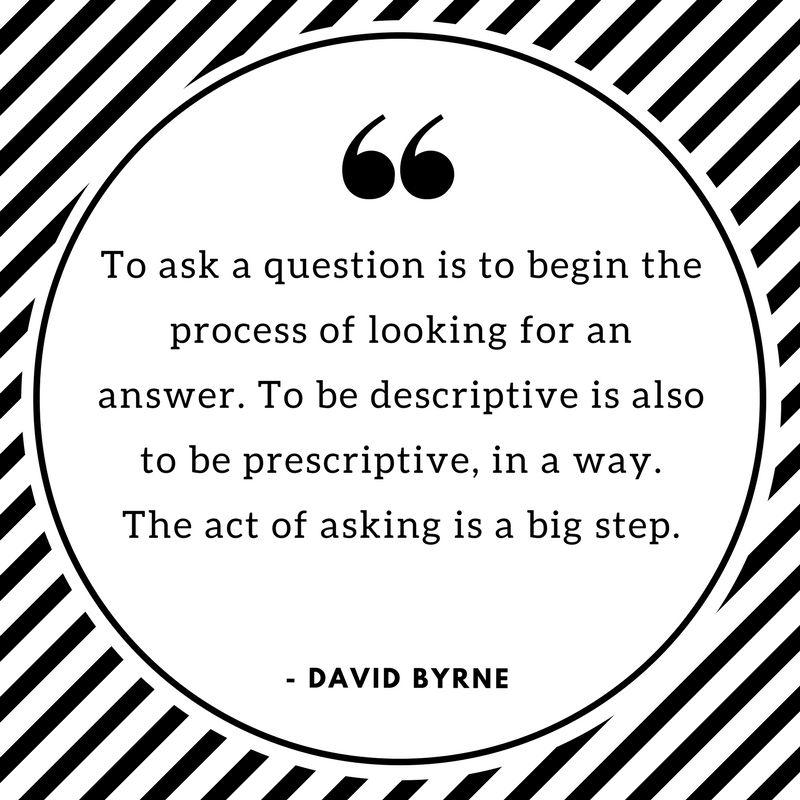 This kind of Conceptual Blending may be considered de rigueur, but is actually one of “six essential aptitudes” Daniel Pink spotlights in his book A Whole New Mind, coined as Symphony. [Symphony] is the capacity to synthesize rather than to analyze; to see relationships between seemingly unrelated fields; to detect broad patterns rather than deliver specific answers; and to invent something new by combining elements nobody else thought to pair. In the spirit of conceptual blending, one way to embrace our own symphonic abilities and cultivate those among our students is to try blending or “smashing” approaches that might work together synergistically. Like chocolate and peanut butter, sometimes two great approaches can work well together, and as a result, become something more powerful as a sum of this new combination. 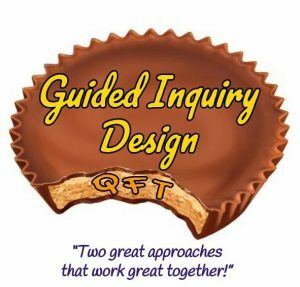 Take the Question Formulation Technique and the Guided Inquiry Model―two approaches that make sense to “smash” together based on their complementary attributes. What is the QFT and How Does it Work? 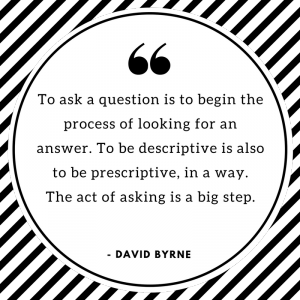 Just as the GID framework offers a fresh way to approach research with students through inquiry-based learning, the Question Formulation Technique (QFT) offers a fresh way to approach and cultivate the art of questioning with students. The QFT “requires one small but significant shift in practice”—students asking the questions instead of the teacher. In Guided Inquiry, a parallel shift happens—from the usual norm of curriculum-dictated research questions to one where the students generate them on their own via a multiphase process of inquiry. Blended together, these two approaches make for a powerful pairing, highlighting inquiry through questioning. Developed by Dan Rothstein and Luz Santana of The Right Question Institute, the QFT is a deceptively simple technique designed to get students to produce, improve, and prioritize questions centered on a Question Focus (QFocus). Through a step-by-step process, students engage in sophisticated, complex thinking and subsequently deeper learning. 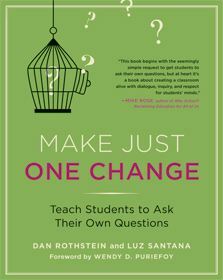 Rothstein’s and Santana’s book Make Just One Change offers explicit instruction on how to put the QFT into action, providing examples of how other teachers have used the technique across disciplines. You can also join the Educator Network for free and gain access to the Educator Resources that include downloadable presentations, guides and handouts for you and your students. I first discovered the QFT by happy accident, and since then, have become not only a huge fan but an active practitioner, self-taught facilitator and devoted advocate after seeing firsthand how effective it can be in transforming the questioning abilities and thinking capacities of those who try it. You can read more about my experiences with the QFT here. In the summer of 2016, I was lucky enough to attend one of their conferences, gaining a deeper working knowledge of the technique through lots of hands-on practice. Since then, I look for every opportunity to use it collaboratively with teachers and students. During our October campus staff development day, I trained interested teachers in the QFT using our school mission statement as the QFocus. Last week, students practiced it to generate questions about the novel The Outsiders. In the upcoming weeks, all 8th grade students will use the QFT to generate guiding questions for their own Genius Hour projects. See this slideshow for examples of QFT questions generated by my campus students and teachers. Formulate as many questions in the allotted time, remembering to follow the rules! How will these questions be used? Reflect on the process of generating questions; what have you learned and how can you use it? In the Educator Resources you’ll find some very handy presentation slides to easily guide you and your students through the process. The QFT’s magic dwells within the step-by-step technique and the QFocus itself. Choosing an effective QFocus takes some finesse, hovering somewhere between an art and a science. But when you find that sweet spot, you will be amazed at the types of questions—and the types of thinking—that students share and show. When looking at the GID framework and the QFT together, their overlapping qualities make a strong case for interweaving them instructionally. Both GID and QFT move students beyond basic fact-finding questions to those that involve higher-order thinking by prompting them to develop their own questions about a notable concept, issue or problem. In GID, students “form their own questions through experiences, reflection, conversation, and writing in the early phases of the inquiry process.” In QFT, students utilize the technique to form their own questions through a systematic process that reflects their own curiosities and as a result, their own thinking. As in GID, the QFT has a similar intention to merge the worlds of school and student by allowing students to construct their “new worldviews rather than having to take on the teacher’s perspective or those mandated by the curriculum or textbook” via developing their own questions and using those throughout the inquiry process. The QFT uses a streamlined formula that draws on students’ own world by allowing them to generate the questions without bias or intervention, versus answering those generated from the curricular world. In that sense, students can then begin creating the Third Space themselves in a way through the questions they are generating. Self-Determination Theory and Zone of Proximal Development are key players in making both Guided Inquiry and the Question Formulation Technique dynamic and impactful methods to use with students. Self-Determination Theory is based on three conditions that underpin and foster intrinsic motivation: autonomy, competence, and relatedness. The Zone of Proximal Development is that “sweet spot” between what students can do with help, and what they can do on their own. Both GID and the QFT strategically place students in the driver’s seat of their own inquiry. In GID, students use their own gravitations and emerging questions to propel their inquiry, developing independence and control over what they learn during the inquiry process. Since the QFT doesn’t layer on stringent parameters as to the kinds of questions students can ask, this stylistic freedom creates autonomy. Both approaches layer in competence (the feeling of being capable enough to reach success) and relatedness (the ability and opportunity to make connections to each other) through the structure and nature of what is asked of students. In GID, the Learning Team designs and plans specific guidance in the form of feedback and interventions for students as needed to ensure that they are still on track while comfortably struggling within a “zone of intervention,” based on the Zone of Proximal Development. With the QFT, students can be grouped in a variety of ways that leverages interpersonal connections through collaborative brainstorming of questions, which are then classified and evaluated in a team-based format. Along the way, teachers act as guides on the side, facilitating without intervening, avoiding modeling the questioning process while keeping the students actively caught in that “sweet spot” of learning on their own, the only safety net being the technique itself. Just as developing fluid and sophisticated questioners doesn’t happen through one QFT experience, building an Inquiry Community will take practice and time. The QFT can be a lynchpin strategy to not only build questioning capacity in students and lead to thoughtful and provocative guiding research questions, but also play a significant role in building an Inquiry Community within GID. Using the QFT embedded within GID offers the Learning Team and the students additional opportunities to cultivate independence, divergent/convergent thinking, and metacognition via as-needed intervention experiences. My next post will share specific points within the GID framework for integrating the QFT. As I’m guessing you can tell, I love to talk about the QFT, so feel free to connect with me on Twitter (@teresa_diaz) or via this blog to continue the conversation.